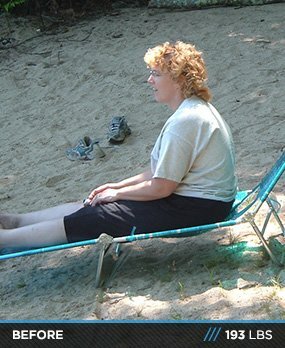 Diane lost 75 pounds and 30 percent body fat at a crucial point in her life. Now she can live healthy into her 50s and beyond! More than a year ago, I was in the best shape of my life. Then one day I didn't feel good and skipped the gym, which stretched into a hiatus months long. I started eating more and enjoyed the food I missed. Within eight months, I put on 45 pounds. I felt awful and overweight and my clothes were tight. The new year came around and I told myself it was time to get in shape. I went back to the gym slowly and worked up to 100 percent of what I used to be. I consulted my gym to get a trainer and was signed up immediately. My trainer put me on a program, I trained with him once per week, and the weight started coming off. A few months later, I was down more than 25 pounds. I hit a plateau and the weight wasn't coming off, so I started to mix it up. 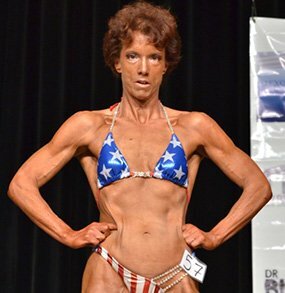 In May 2012, I wasn't happy with my coach and decided to quit and search for a new coach to help me train for my first figure competition. I wanted somebody knowledgeable, caring, and honest who could get me in the best shape of my life. It was June 7, 2012, and my friend was training with Shannon Petralito. I asked my friend for Shannon's number and met her at Cathy Savage Studio during camp and she was very nice. I contacted her on June 9, 2012, and we talked for more than an hour. I could tell by talking to Shannon that she was genuine and passionate about her work. We talked about goals and competing, I signed up, and off we went. At this point, I weighed 150 pounds. Shannon took time with my nutrition plan so it was tailored specifically for me. While she set my diet up, I officially became part of Shannon Petralito Fitness on June 15, 2012, which was the happiest day of my life. I started my new nutrition and workout plan on June 26, 2012. The nutrition plan consisted of six meals per day made up of lean protein, organic veggies and fruit, and whole grains. It was easy to follow and I didn't feel hungry. I'm down to 117.9 pounds and couldn't be happier. This is the healthiest I've ever felt. It's been the best experience of my life, and the best is yet to come. I just competed in my first bodybuilding competition on June 1, 3013, and I plan to compete again in the fall. I enjoy inspiring and motivating people to be the best they can be. Nothing gives me more pleasure than helping people on their weight loss journey. I learned a lot doing it myself. I want to give a special thank you to Earl Strong, who's been with me from the beginning. I couldn't have done it without him. When I set my mind to something nothing can stop me. The most challenging part was the diet. It's a mental game that plays tricks with your head. Some days were worse than others, but I kept telling myself I had a goal to compete in June. In the end, everything worked out and I stayed true to my goal. Never give up. It will happen. My future plans are to compete in the fall of 2013 and 2014. During the summer months, I plan gain size to fill out and bulk up. I will start studying the NASM CPT this summer to become a trainer and help people meet their goals to become healthy and compete. I hear many people say they cannot do it because they're too busy and don't have time. People need to realize if they don't do it, nobody will do it for them. Make yourself a priority because it's important for your health and wellbeing. Make it a point to take time out of your busy schedule each day to do something nice for yourself because you're worth it. Never give up or give in because you will see changes. It takes time, consistency, and patience. Reward yourself when you hit a short and long-term goal. Go out and celebrate at a nice restaurant or buy a new outfit. Celebrate every accomplishment and never put yourself down or let anybody drag you down and say your goals are crazy. No dream is too big. You have nothing to lose. 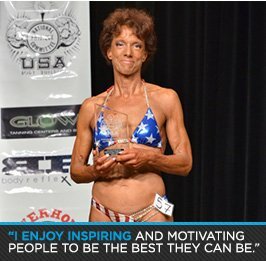 Bodybuilding.com is a great wealth of knowledge. I love lifting and use the site daily to reference workouts and different ways to hit body parts. Bodybuilding.com is my main site to order products. I also use the site for great recipes to spice up my meals. Nothing makes me happier than reading the transformation stories. I want to thank you for giving me the opportunity to share my story with the world. I hope to motivate and inspire people to be healthy and happy.